What defines a champion? Powerful movie, Champion delivers an account of friendship and forgiveness that touches the soul. 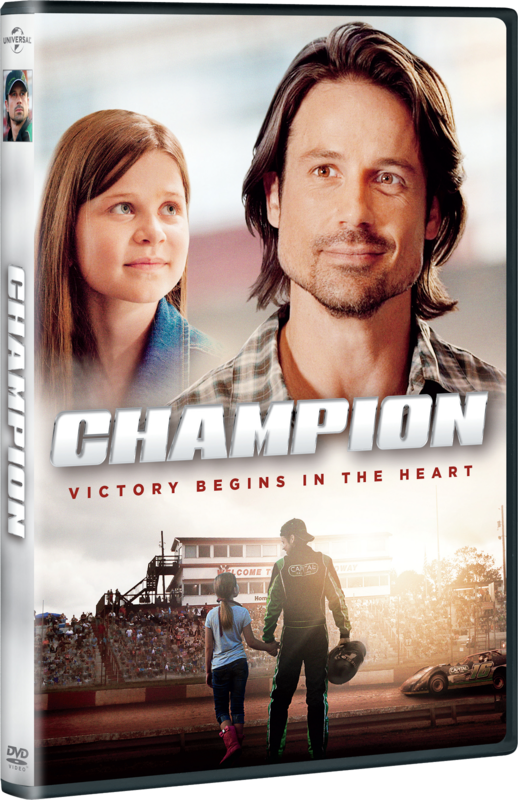 Champion now available on DVD, Digital, and On Demand from Universal Pictures Home Entertainment shares a story with a enlightening message to inspire the entire family with revealing bonus features including music videos, film outtakes, plus a featurette taking viewers behind-the-scenes. One of the more engaging movies that I have had the opportunity to view, Champion scores bonus points with a story based upon challenges and second chances. Thank you to the public relations team for Brannon Films and Universal Pictures Home Entertainment for providing an advanced release copy of Champion for promotional editorial content purposes. "Sean Weathers is a hotshot dirt track racer with a thriving career, adoring fans, and a loving daughter. Jack Reed is a successful businessman working to reconnect with his estranged son. When a single mistake results in tragedy, it leads the paths of these two men to cross, and an unexpected bond forms between them. Together, they must work through the painful journey toward healing. But as secrets come to light threatening to destroy all hope, can they put their faith in God and discover a way toward redemption? Experience this story about the power of faith, love, and the true freedom of forgiveness." · The Heart of Champion – The story of how the movie came about, the grassroots efforts that made the film possible, the crafting of the story, and what the filmmakers hoped the viewers would experience. I'm excited to have the opportunity to share the unforgettable message of Champion with my family. Visit Champion and Universal Pictures Home Entertainment for your copy today.